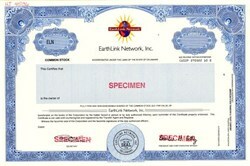 Beautiful engraved specimen certificate from the EarthLink Network, Inc . This historic document was printed by United States Bank Note Company and has an ornate border around it with a vignette of the company's early logo. This item has the printed signatures of the Company's President, Charles G. Betty and Secretary. 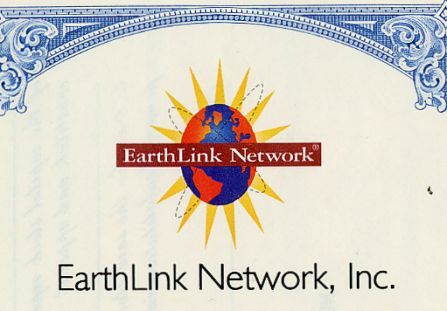 EarthLink brings the Internet to approximately 4.9 million subscribers every day. Headquartered in Atlanta, EarthLink provides a full range of innovative access, hosting and e-commerce solutions to thousands of communities over a nationwide network of dial-up points of presence, as well as high-speed access and wireless technologies. With more than 532,000 high-speed subscribers, EarthLink is one of the leading broadband Internet service providers. EarthLink is the only ISP to offer high-speed Internet access nationally through all three major broadband technologies: cable, DSL and two-way satellite. The company also offers its award-winning Internet services on a wholesale basis via cable, DSL and fixed wireless technologies. Its commitment to offer a variety of broadband technologies through multiple vendors allows EarthLink to offer its high-speed services to customers in more areas of the country.